All remaining SCATTERED SEED has been reduced from $40. to $25. !!! 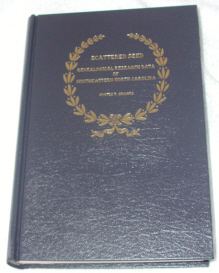 Presented by North Carolina Society of Historians, Inc.
Genealogical Research Data of Southeastern N.C. SCATTERED SEED necessarily emerged from a large and eclectic accumulation of data from a continuing personal research of my Campbell ancestry. This book is an effort to preserve our heritage as a memory, treasure and blessing for future generations. My research in the counties of Bladen, Columbus, Cumberland, Richmond, Robeson, Moore & Rowan reveals evidence of marriages, bible records, wills, estates, census, court records and private collections. Also included are church and cemetery records and marriage and death accounts from the Fayetteville Observer. Histories, diaries and treasured family letters bring life to their authors and are guaranteed to fascinate their readers. This publication provides data for an intensive study of the families, who by friendship and family tie are eternally interwoven with the Campbell Clan. Chapter Seven contains a complete transcription of the one hundred and fifty two page ledger of Laura Pearson Ray. Her husband, Neill W. Ray, Sr. has been given much of the credit for Fayetteville's extrication from financial distress in 1881. Laura, may not have been accustomed to dealing with financial matters, but she truly deserves similar recognition as she appears to have carried on her husbands business affairs long after his death. On November 7th, 1899 she recorded her husband's funeral expenses as $106.13. In the upper right-hand corner of her ledger she pasted a newspaper clipping showing how to compute interest and began a book which became a most fascinating monthly account of the next thirty years of her life. The activities of many well known Cumberland County folks such as, Ray, McKay, Monroe, Thornton, Broadfoot, Pearson, McRae, Remsburge, Haigh, Lilly, Hale, and many others have been recorded by the careful hand of Laura Ray. Family outline boxes are designed to show how a particular group is perceived to fit together, based on my research. Here it is left up to the researcher to decide if the fit is perfect. This work is intended as a guide rather than a "dyed in the wool" statement of fact concerning any certain person or family. Short documented facts, not necessarily connected to a particular family, have been scattered throughout this book as 'Miscellaneous Research Data.' Copies of original documents such as letters, wills, etc. have been computer enhanced in an attempt to present interesting legible graphics while taking care to maintain the integrity of each copy. In most cases the original spelling has been retained, and minor punctuation is added for clarity. Footnote data is intended as a guide and should be verified for proper ancestral links.